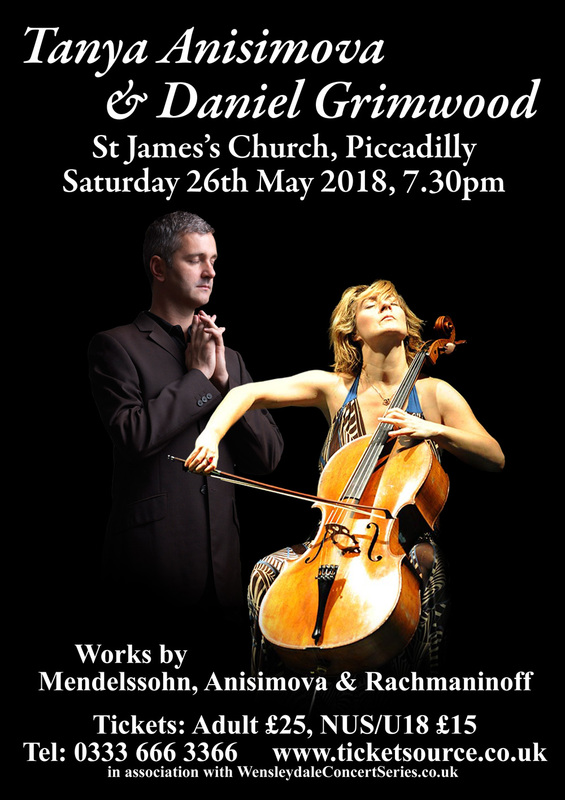 Cellist and Composer, Tanya Anisimova is pleased to be making her London debut. Born in the Soviet Union she was educated at the Moscow Central Music School and the Moscow Conservatoire. Following further studies in the USA at Boston and Yale Universities she received a doctorate from Yale. She won First Prize at Concertino Prague International Competition, All-U.S.S.R. String Quartet Competition, and she is a top prize winner at Min-On International Competition in Tokyo and First Shostakovich International Competition in St.Petersburg. Tanya is now an American citizen and lives near Washington DC. She has performed across the United States (including Carnegie Hall) and widely internationally. Daniel Grimwood is no stranger to St James Piccadilly or to performing in London. Felix Aprahamian described him as “Probably the finest all‐round musician I have ever known”. He is based near London and performs regularly throughout the UK and abroad. Daniel is a prolific recording artist and has won praise and outstanding reviews in national and international press and music magazines. He also appears regularly on BBC Radio 3 and BBC TV. The major international music publisher Edition Peters invited Daniel to record a debut CD for their record label - the result was a CD of Faure's Nocturnes which won immediate international acclaim and led to an invitation to produce a second CD. This recording of piano music by Henselt, a contemporary of Liszt and Chopin, was also an instant success and has brought Daniel many invitations to perform at Henselt's birthplace, Schwabach in Bavaria. Daniel is not only an outstanding solo pianist but an exceptional chamber musician and regularly performs chamber music in the UK and overseas (most recently a tour of Sweden).